Do you remember Lyndsey's Craft Spot guest post about making a growth board during Baby Week? Ever since then, I knew I wanted to make one. I have such happy memories of stretching up on my tippy toes while my Dad measured me on the wall in our Laundry Room. The marks are still there--the story of our growing up! I followed Lyndsey's tutorial perfectly, so I won't re-has it for you... I'll just show off the finished product! First and foremost, I am slightly heartbroken because I can't show it off in all its glory! The real growth board does not say "Little Man"; it obviously says his first name. But in the interest of preserving Little Man's privacy, I did a little Photoshop trick to write over his name. His name is written in brown vinyl, and it looks stinkin' cute! Use your imagination! This was such a fun project! 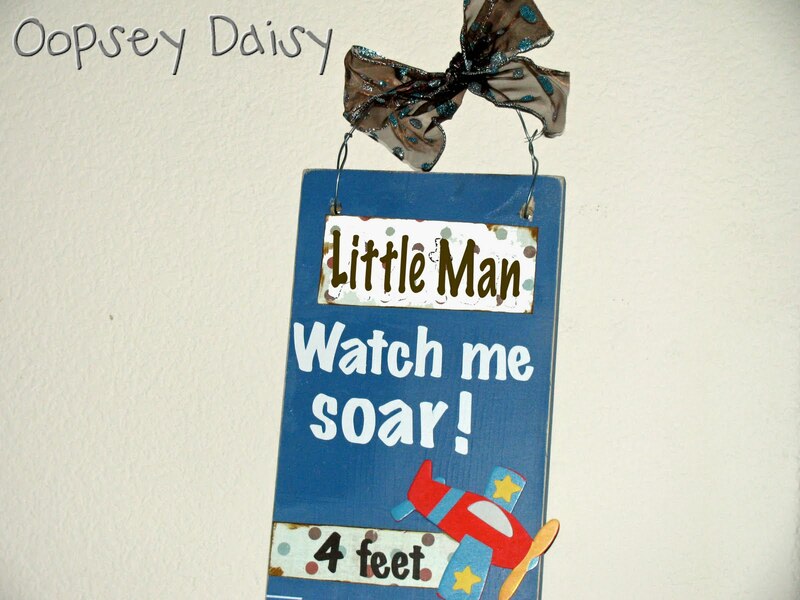 Little Man has an airplane nursery... his Daddy is a pilot So Mr. Oopsey Daisy really got into this project, helping me to design all of the details. I bought the wooden airplane at Hobby Lobby, always wondering what I would do with it. I gorilla-glued that bad boy right onto the board! It's a splendid finishing touch! This was the fun part! We measured this big kid against his growth board for the first time. 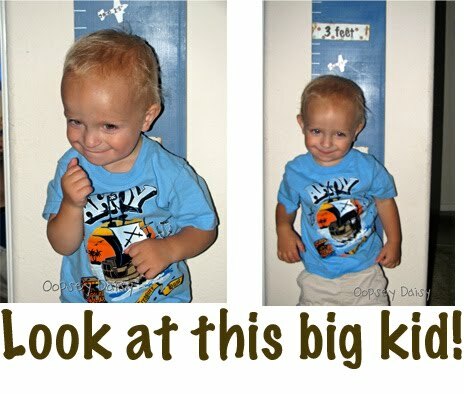 Little Man is very tall and skinny for his age... he is 90% for height, but only 10% for weight. He is already 2 feet/8 inches! Sticking with our airplane theme, we decided to mark his progress with vinyl airplanes. I marked the date and his current height on the airplane. I can't wait to track his progress as he grows with a twisty turvy airplane trail! I marked each inch using a paint pen and ruler. (I actually bought paint pens to write in the quiet book... I don't love how they work on fabric, but they worked just fabulous on wood!) I demonstrated each foot marker with polk-a-dot scrapbook paper, distressed each, and added the brown vinyl words over the top. I did the same for his name. To finish up, I drilled holes and added the wire to hang it. The bow was the cherry on top! 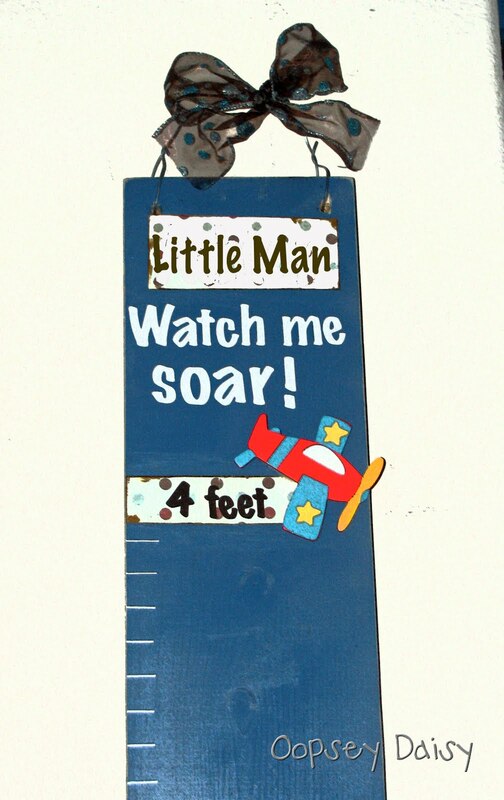 What a fun addition to Little Man's room--perfect for that skinny wall in his room! So cute. I think my grandson's need one of these. Yeah!! You did a great job- it turned out adorable!!! I just made a few as baby shower gifts and they were a hit:) Thanks for trying out the tutorial!! What a great idea! Perfect for his bedroom theme too. Super cute! And the vinyl airplanes are a great way to mark it! This is adorable! 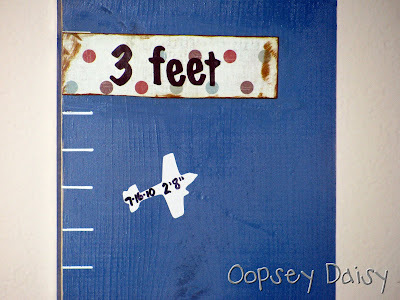 The airplane height markers are fabulous. A great extra touch! And your little guy looks like he just loves it! That is darling. I have seen quite a view floating around blogland. My kids are at the age that they would love this! Thanks for inspiring.